In addition to experiencing unique natural and historic sites preserved in Arkansas’s state parks, visitors can also explore outstanding museum collections and see state-of-the-art exhibits in park visitor centers. According to State Parks Director Greg Butts, “At many Arkansas State Parks museums and several exhibit galleries in park visitor centers, we previously charged a small admission fee. 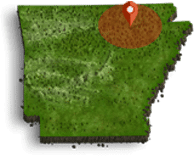 All fees and charges in the state parks are detailed online at ArkansasStateParks.com. They are also included in the Arkansas State Parks guidebook, the 80-page full-color guidebook to the 52 state parks. To order this free brochure, contact: Arkansas State Parks, 1 Capitol Mall, Little Rock, AR 72201; 888-287-2757 (toll free). For further information, contact: Joan Ellison, public information, Arkansas State Parks, 1 Capitol Mall, Little Rock, AR. Phone: 501-682-2873.